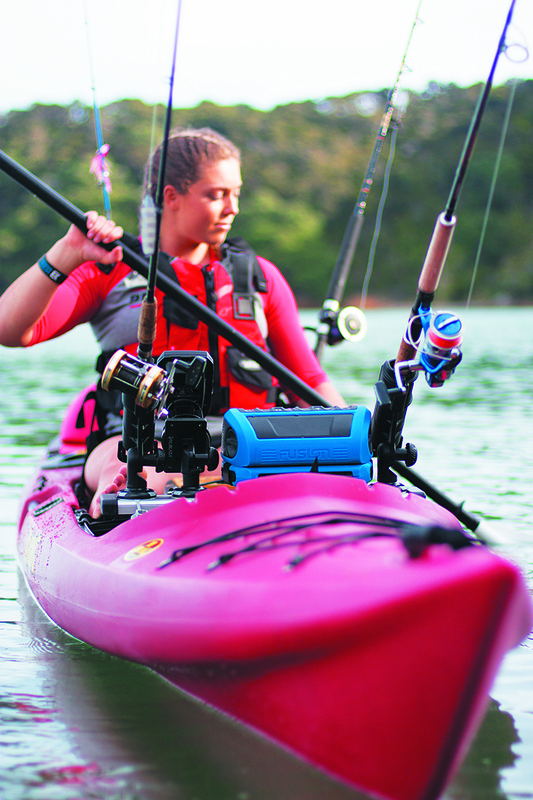 This kayaking angler is rockin’ with the StereoActive Portable Water Sports Stereo while searching for interesting bottom structure with her Garmin STRIKER™ 4cv Fishfinder with GPS. Fishfinders allow anglers to see a graphic representation of what is beneath their boats so they can identify fish. To choose a fishfinder, consider the type of unit—whether it includes GPS and is part of a boatwide network, size of the fishfinder’s footprint, resolution of the display, how much transmitting power you need, and what frequencies will work best in the inland, coastal or deep-water environment where you fish. Do you want a standalone, combo or network fishfinder? Standalone fishfinder: If you just want to see what’s below, dedicated fishfinders give the biggest display and the most performance for the least cost. If you have a small boat that you use for fishing small inland lakes or are on a limited budget, a standalone fishfinder is for you. Conversely, if your pilothouse has room for multiple displays, or if you just bought a new GPS, get a serious big-screen fishfinder. You can usually add a GPS sensor later to many units, turning them into chartplotter combos. Combination fishfinder/chartplotter: Combo units make sense for most owners of mid-sized boats. Use GPS for navigation to the fishing grounds, view both on split screen, or view only the fishfinder. 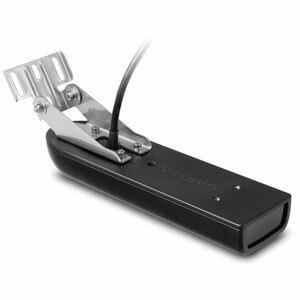 “Black box” sounder modules can turn many chartplotters into combo units, with the installation of a transducer. Networked system: Fully networked systems are available from all the major suppliers, and usually will support a huge range of data sources including radar, raster and vector GPS charts, video, and SiriusXM satellite radio. Many allow Bluetooth/WiFi, and you can control them from your iPhone or Android smartphone. Your fishfinder, often an external “black box” module, is just one of these sources of data. Multiple-display network systems are great for medium-sized or large vessels. Capabilities get more amazing every year. 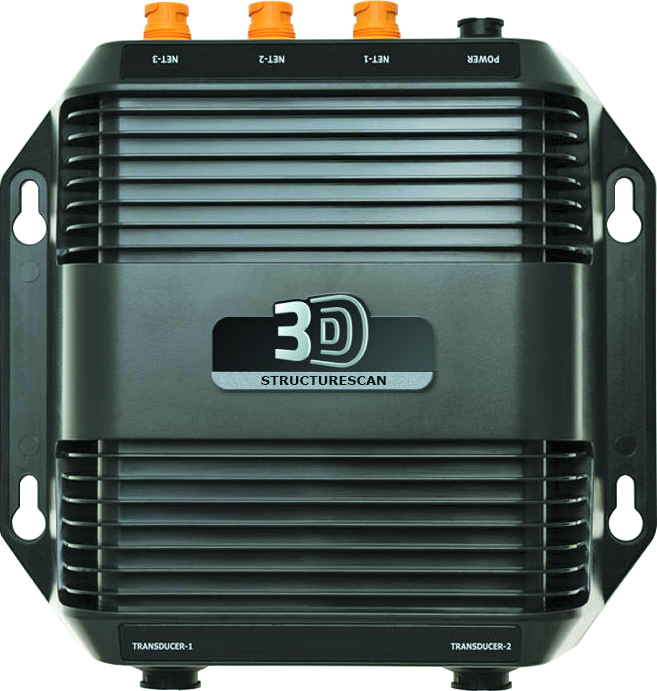 The Lowrance StructureScan 3D creates a high-resolution, 180-degree, three-dimensional view beneath your boat. What display specs—colors, pixels, size? LCD displays are made of a grid of “picture elements,” tiny dots that individually darken when electrical current is applied, with their name shortened in common usage to “pixel.” More vertical pixels mean higher depth resolution, as each pixel represents less depth. The number of pixels in a screen’s horizontal axis determines how long objects stay onscreen before they scroll out of view, of significant importance with split-screen displays showing narrow columns of side-by-side information. 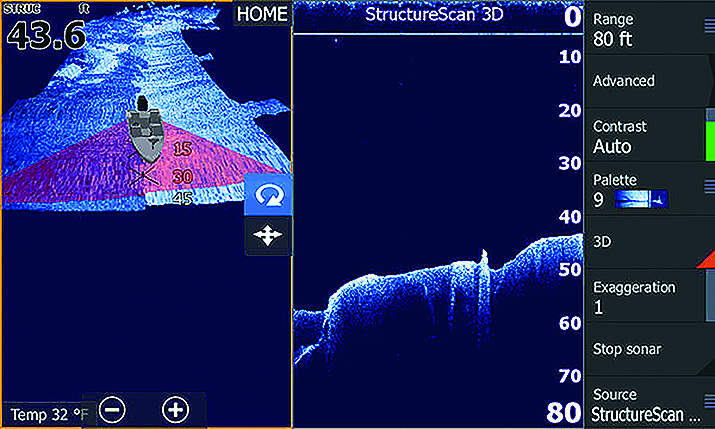 The picture-like, three-dimensional views shown above are displayed on the Lowrance HDS Gen3 series of fishfinder/chartplotters, when used in combination with the StructureScan 3D Skimmer® transducer (below) and module. More pixels per square inch will provide better detail of structures, a better representation of what’s below you, and improved split-screen images. More pixels—higher screen resolution and a big screen—allow you to see the air bladders of smaller fish, see fish near the bottom, separate closely spaced targets from one another, and to see fish on the edges of “bait balls.” But remember: the contrast of the display must also be sharp in order to use the resolution. Like many features, you get what you pay for with display resolution—the more the better. Most quoted screen sizes refer to the diagonal distance in inches across the screen. Widescreen displays allow you to see more meaningful information when you split the screen to display more than one type of data, showing your GPS chart, radar screen, or returns from more than one transducer. How much transmit power, and what frequencies? The power of a fishfinder—the strength of the “ping”—is expressed in watts RMS (root mean squared). Power is directly related to how well you see in silt-laden water, view down to greater depths, and successfully resolve separate targets and bottom structure. A 500-watt (RMS) fishfinder should have plenty of power for most coastal applications. Serious bluewater anglers should look for 1,000 watts or more. Inland lake fishermen can see the shallow bottom with only 200 watts. StructureScan 3D transom mount transducer. Fishfinders operate using a single frequency transducer, dual frequencies, multiple frequencies or a broadband CHIRP system. In general, higher frequencies give the finest detail resolution, the least background noise on your screen and the best view from a fast-moving boat, but don’t penetrate as deeply as lower frequencies. Shallow-water inland anglers generally choose higher frequencies of 200kHz, 400kHz or 800kHz. For maximum depth, use lower frequencies. We recommend 200kHz or higher (up to 800kHz) for water depths up to 200' and 80kHz or 50kHz for deeper waters. What about CHIRP or broadband fishfinders? The newest style of broadband fishfinders, commonly called by the acronym CHIRP (Compressed High Intensity Radar Pulse) don’t transmit on just one or two frequencies. Instead of transmitting only 200 or 50kHz, for example, CHIRPing devices transmit a signal that sweeps linearly upward (from 40 to 75kHz, 130 to 210kHz, or other frequency ranges). CHIRP fishfinders transmit less peak power than a conventional fishfinder, but their wide-band, frequency modulated pulses (130-210kHz, for example) can be very long in duration and put 10-50 times more energy into the water. Using digital pattern matching and signal processing, CHIRP devices achieve unprecedented resolution and target detection. Your ability to resolve individual fish, or separate fish from bottom structure, is now a matter of inches, instead of several feet with traditional fishfinders. See individual fish in groups, instead of a single mass. Depth ranges of 10,000 feet are standard with these broadband devices, which include sounders from all of the major brands. Some of these sounders feature dual-transceivers that allow for simultaneous and independent dual transducer operation, which allows complete customization, as you can CHIRP or dial each transducer into specific frequencies. CHIRP devices can transmit simultaneously on high and low frequencies. The lower frequency gives greater depth penetration, and it requires less power than a higher frequency signal so it generates less noise. The result is a “whisper into the water” that locates the fish without disturbing them. The higher frequency signal gives even finer detail at shallow to mid-water depths. Want to look to the side, straight down or all around? Simrad B60 thru-hull with 12° tilted element for boats with 8° to 15° hull deadrise. Garmin GT30-TM Transom Mount is a high frequency (455/800kHz) transom mount for SideVü/DownVü inland imaging. 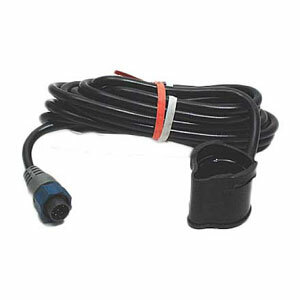 Garmin adjustable in-hull transducer with an adjustable deadrise angle, can be installed in solid fiberglass hulls 5/8" or less in thickness. Inland fishfinding has changed, with high-frequency (455 or 800kHz) transducers that look to the side, straight down or can aim over a 360-degree range. Fishfinder manufacturers offer the inland angler a growing (and often confusing) assortment of choices in frequencies, beamwidths, even the underwater direction you can look. Inland anglers who search for fish in shallow lakes don’t need the power to see down to 5,000', but can gain a big advantage by looking out to the sides, so Garmin, Raymarine and Lowrance have products using multi-beam transducers for that purpose. Here’s where the Marketing Jargon takes over, with names like StructureScan HD™ and CHIRP DownVision. Higher frequency transducers have shorter wavelengths and more wave cycles per second, which means you can visualize more details (smaller fish) but have only shallow to moderate depth capacity. One sound wave at 200kHz is slightly longer than 1/4", so a 200kHz sound wave will be able to detect fish as short as a quarter of an inch. A 200kHz transducer has a range of only about 600'. High frequency provides a crisp, clear picture of the bottom with the tradeoff of less depth range. For best resolution, choose 800kHz or 455kHz transducers. Lower frequency transducers, with longer waves and fewer waves per second, show less detail (larger fish) but carry more energy and penetrate to greater depths. One sound wave at 50kHz is slightly larger than 1", so a 50kHz sound wave will only detect fish if their air bladders are large, slightly longer than an inch. Lower frequency won’t provide as clear of a picture but will operate effectively in the depths of the ocean or Lake Michigan. Dual frequency transducers use the same piezoceramic element (a sort of vibrating crystal) to send and receive pulses of more than one frequency (sometimes simultaneously). Low frequencies typically use wider beams, helping you to find large objects, like structure where fish hide. High frequencies let you zero in on the fish right below your boat. 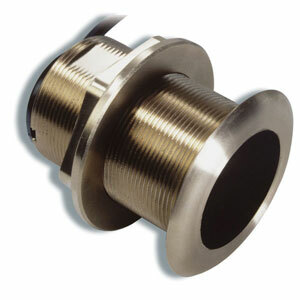 Bronze thru-hull housings should not be used in aluminum boats. The interaction between the aluminum and the bronze, especially in the presence of salt water, will eat away the aluminum hull and/or bronze housing. Fishfinders intended for the small-boat, freshwater angler often come with a transducer, usually a transom-mount type. Many transducers are purchased separately. 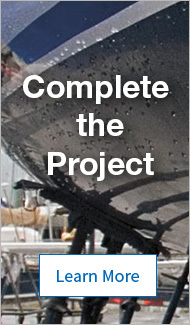 Thru-hull: most challenging to install, but likely to provide best signal quality. Displacement power and sailboats generally use thru-hulls. 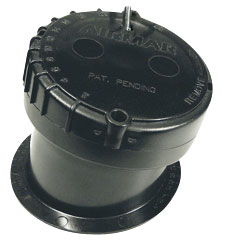 A thru-hull triducer contains depth and temperature sensors, plus a speed paddle wheel. Transom-mount: adjustable-angle bracket is screwed or bolted to transom, with transducer hanging below and behind hull. Simpler installation, but may encounter more turbulent water flow. In-hull: “Shoot through hull” transducers need no direct water contact. They are glued to the inside of the hull with silicone or epoxy. They do not work on cored hulls or steel hulls, only for solid fiberglass. 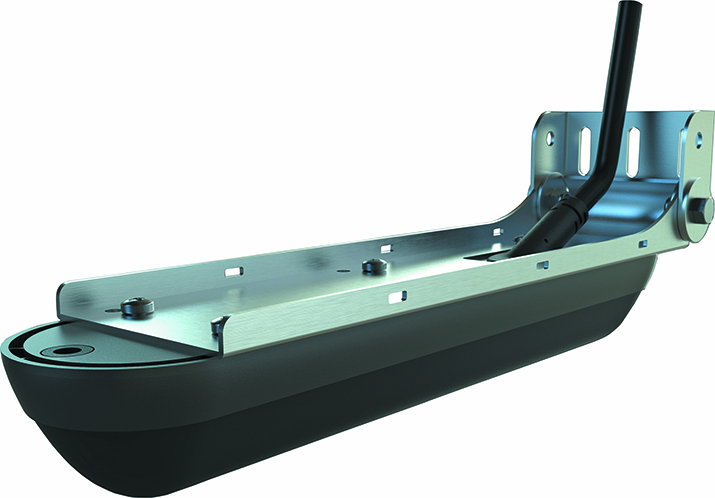 Both in-hull and transom-mount styles are popular for trailerable boats. Trolling motor: Clamped to the outside or permanently installed inside propeller hub of trolling motor. Minn Kota Universal Sonar and MotorGuide Sonar Ready models include built-in 200kHz transducers that fit many popular fishfinders.